Blackberry and raspberry gardeners can achieve a huge boost in berry yield by learning a technique known as tipping, according to a University of Illinois Extension horticulture educator. 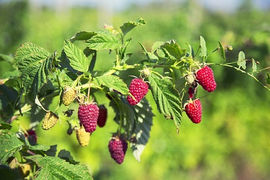 Blackberries and raspberries, both types of caneberries, are popular small fruits with similar management strategies. These plants have similar growth and fruiting characteristics but Holsinger says some distinctions are necessary depending on the variety. Removal of the shoot tip when it is of a small diameter and easily pinched by hand leads to a smaller wound, thus less susceptibility for disease infection. Tipping at this stage of development is referred to as soft tipping, but Holsinger advises to still use caution and wear protective clothing and gloves because some varieties have thorns. “Although the optimum time to tip the shoots is while they remain smaller and unlignified or non-woody, hard tipping can also be an option,” says Holsinger. Hard tipping occurs when the tissues have lignified and become hardened. A pair of pruning shears or loppers will be necessary. Bypass pruners allow for a cleaner cut and are recommend over anvil pruners. The height to which the primocanes are tipped is somewhat subjective. There are both primocane-fruiting cultivars, which produce fruit in the first year, and floricane-fruiting cultivars, which produce fruit in the second year. Primocanes (first year canes), should be tipped according to their vigor and when they reach the height of the trellis, if applicable. •	Red raspberries do not require tipping. •	Black and purple raspberries should be tipped no higher than 30-36 inches, with the exception of purple raspberry cultivars like ‘Royalty,’ whose growth habit is similar to its red raspberry parent. •	For floricane-fruiting blackberries (for erect/semi-erect cultivars), tip primocanes at 45-50 inches. •	Primocane-fruiting blackberry cultivars may be double tipped: once the main cane reaches 25-30 inches, and again when the laterals reach 25-30 Tipping and other pruning should be done in dry, clear weather so the wounds have a chance to heal before rain is expected. Clean pruners with a ten-percent bleach/water solution or rubbing alcohol to prevent the spread of disease between plants. “Following good cultural practices like proper sanitation, adequate air circulation, and cane management will help to prevent disease,” says Holsinger. “Scouting is an important tool to find diseases or viruses early.” Scout caneberries often to determine the length of canes. Some vigorous cultivars need to be tipped multiple times. Laterals can be shortened in the dormant season and usually provide for larger fruit size.